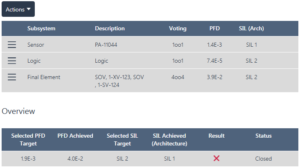 Subsystems can be configured by clicking on the required Hazard -> SIL Verification -> RBD Analysis. Note: Subsystems that do not have Elements configured within those subsystems will be disabled, and will appear greyed out (i.e. “Add Sensor Branch” menu option is disabled if there are no Sensor Elements configured). An overview of the subsystems will be presented showing the contribution of each subsystem towards the overall PFD / PFH. A live view of the Reliability Block Diagram (RBD) is shown as it is being created. Note: If the SIL Determination has been carried out in Continuous Demand mode, then PFH Target and PFH Achieved are used with the units of per hour.